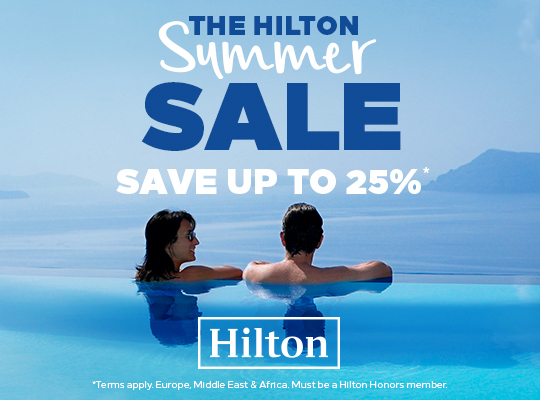 The Hilton Summer Sale Is Now On. Don't Miss Out On Savings Of Up To 25% On Selected Hotels in Europe, Middle East & Africa. Stays must be booked by September 3, 2018 and completed on weekends until October 7, 2018. Remember that you should also be earning Double Points on these stays with the current summer Hilton Honors promotion that runs until August 31. Find that and all other Honors bonuses here. Also remember if you have the Platinum Card from American Express you get automatic Hilton Honors Gold status that will get you extra benefits on these stays. Simply look for the Summer Sale terminology when you search for your hotels to get this deal!